Toronto’s definition of Hakka cuisine isn’t necessarily correct. Rather than linking it to the style of cooking from Hakka Chinese individuals, images of flavourful Chinese Indian dishes come to mind instead. Federick is a Scarborough institution and although people argue whether it’s deteriorated through the years, I find their offerings just as filled with spices and plentiful as from my youth. Their dining room has been revamped, not exactly palatial but the comfier seating and bright colours a step up from the hole-in-the-wall I remember. 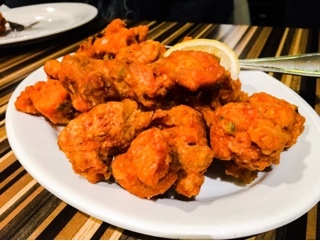 Perhaps their most famous dish is the chicken pakora ($8.99), deep fried nuggets of sizzling hot juicy chicken adorning every table in the restaurant. Marinated so the saltiness runs deep into the chicken, specks of green chilies peak out of the batter to remind you of where the spicy, but bearable, heat originates. The chili chicken ($8.99) could use more spices, the main flavour derived from the soy sauce that forms the gravy that coats the diced meet. Nevertheless, it’s a fragrant dish and goes well with the steamed rice and what heat it lacks there are pungent hot sauces on the table that can always be added. 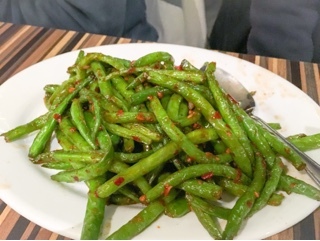 Despite the flecks of redness over the kan shue green beans ($7.50), they aren’t spicy. Although, this could be on account of the pakora and chili chicken already numbing the taste buds by the time the third dish arrives. I love the garlicky bits coating the beans, which helps the vegetables hold their own amongst the other strong items. 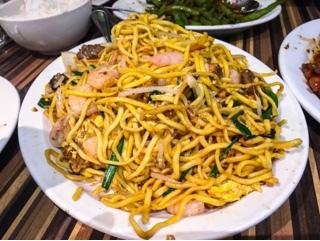 The Hakka mixed chow mein ($8) is delicious, combining thicker Shanghai noodles with the curry and egg mixture found with Singapore vermicelli. Plenty of shrimp, beef (we substituted for the regular chicken), bean sprouts and green onions are found throughout the savoury chewy noodles. Even with a second location in Markham, Federick is still busy; every table was filled during our weeknight visit and I was lucky to get a parking spot in front of the restaurant. Yet, the meal is a quick one and if you’re in a hurry there’s always the trusty take-out section located right beside the dining room. 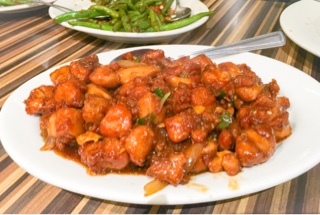 If you can handle the spice, give Federick’s Chinese Indian dishes a try.